A man who beat and poisoned his partner's 22-month-old daughter has been jailed for a minimum of 20 years. Eve Leatherland had multiple fractures and a fatal dose of codeine in her system when she was found "stiff" in her bed in Cornwall in October 2017. Her mother Abigail Leatherland, 26, was found guilty of causing or allowing her death but acquitted of manslaughter. She was jailed for three-and-a-half years. Judge Mrs Justice May told Curd he "wilfully, fatally failed Eve over and over when you repeatedly assaulted her". 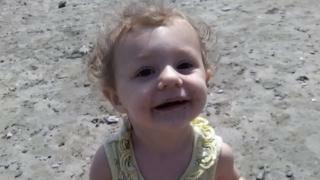 Sentencing Leatherland, the judge said she "did not take any steps to protect or care for Eve". "I have no doubt your greatest punishment is knowing that you failed your daughter when she most needed you. She added it was a "bleak, disorientating and comfortless way for that little girl to die". Eve's ribs and skull were fractured and re-fractured in "at least three" attacks, and she was poisoned with the painkiller in an attempt to mask the injuries, the court heard. She had also suffered a ruptured liver prior to her death at their then home in Liskeard. The jury was told Eve had almost certainly been dead for several hours before her mother dialled 999 on 5 October. Leatherland had moved to Cornwall from Mansfield, Nottinghamshire, earlier in 2017. During the trial, jurors saw a number of photos and videos taken by the defendants that showed Eve looking extremely unwell in the days before she was killed. They also saw pictures of her blood-stained mattress. Consultant paediatrician Dr Deborah Stalker said she had counted 19 surface bruises on Eve's head and body and 12 abrasions. She told jurors there was "no explanation" for some of the facial bruises and they were "highly suggestive of abusive or inflicted injuries". Prosecutor Sean Brunton QC said Eve's injuries were "most commonly associated" with a car crash. "The pain she must have experienced can only be imagined," he said.